Well, let me tell you guys a bit about the Meetup. I arrived at 'All Bar One' (pub/restaurant) just before 12pm and within a few minutes I was pleased to meet B, a member who had been absent from our meetups for some time as he lives a bit further away. We spent a little time catching up with what we had done since we last met. Next came a lady who had attended our meetup once previously (in September). She came with another new member I had introduced since they were coming via the same train station. Since the new member had already been chatting with this lady, she didn't feel so much the new member at the meetup. After the meal, we returned to Leicester Square and met up with our 10 th member. We sat in a café overlooking the Square and had cocktails. 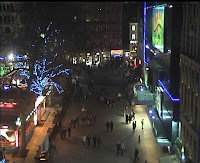 The square had fair-ground attractions and all the surrounding trees’ branches were covered in glistening green lights. There was a magical feeling in the air, it had kind of like a Disney quality with sparkling specs of silver awash. Just then, a huge army (perhaps 100) of red-robed Santa Clauses arrived, some were female Santas with open robes sporting the most daring of bikinis. I took my glasses off as they seemed to be steaming up; Christmas had indeed come early! The whole day was largely a social event but we had discussed how our Group seems to have a higher incidence of certain disorders such as Irritable Bowel Syndrome. Dyspepsia, Chronic Fatigue Syndrome and Multiple Chemical Sensitivities. For instance one of the new members told us how his odour seemed to start at exactly the same time as the onset of his Irritable Bowel Syndrome. Another new member told us how her only symptom was a most pervasive foot odour which her husband couldn’t detect at home but her work colleagues always could. Interestingly, surgery (lumbar sypathectomy) had totally resolved the odour in one foot but it still remained in the other foot! Another member told us how she had recently been tested positive for Secondary Trimethylaminuria and asked about the treatment options. I pointed her to the NIH protocol and I mentioned to her that we hope to refine this even further with experience from our future Patient Database. The members had diverse conditions and had tried a diversity treatments, mostly without success. Unfortunately, I can not post up any pictures of our meetup for you guys as we have a no-photography policy at the UK meetups. One of the new members did ask if he could take a movie of us on his mobile phone but we explained this rule has been introduced to preserve confidentiality, especially for new members who are likely to feel more guarded in their first meetup. I would have allowed myself to be photographed for the group but I put on a few pounds in the winter time as I’m too lazy to go to the gym when it’s dark so early. Out of the 10 members who attended, 4 were new members. 6 men and 4 women attended the meetup and our ages varied from early 20s to 60s. With 10 people present on 2 adjoining tables it was often difficult to hear what the distant members were saying and we invariably ended up chatting in 2 separate groups. However, everyone seemed to feel very comfortable at the meetup, even the new members. Most of us decided to keep in email contact with each other through me. Many made new friends, especially those living close to them. I encourage every member to have at least one email buddy from the group. Many have have found this buddy contact helpful. I would encourage all members to investigate ways of arranging group meetups near them. This is about a lot more than picking up useful tips, this is about a kind of emotional healing/ bonding.